I took a break in my weekend hiking to take part in my first 5K, the Firefly Run Atlanta. 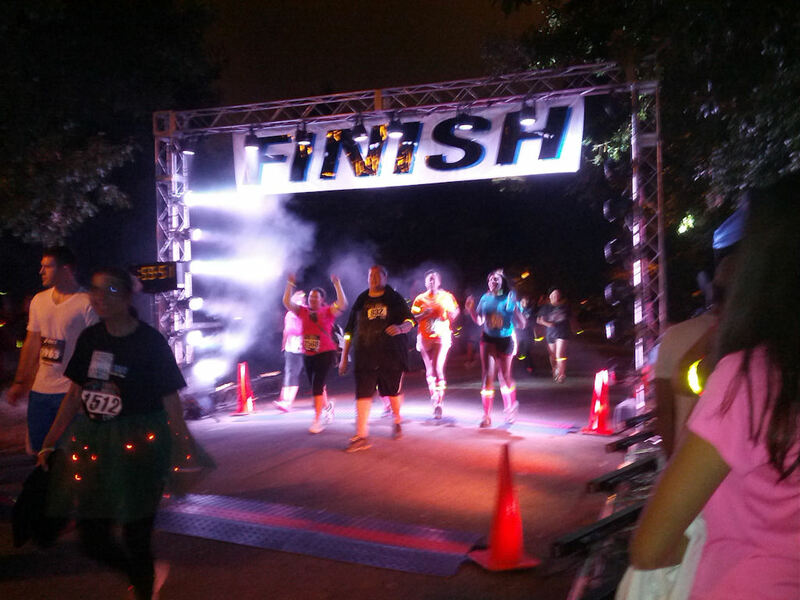 Now, I didn’t say I ran my first 5K… but I did complete it. Maybe next year I’ll be able to run it. It was a blast and I had some great friends that went along with me for the adventure. If you’re not familiar with the Firefly Run it’s a nighttime 5K. Everyone gets these blinking armbands and most people load up with glow sticks, glow necklaces, glow bracelets, glow sunglasses… you get the point. I saw one couple that had LED lights on their hat, glasses, clothes and even blinking mouthpieces. I’m not sure how many people usually participate in these races but there were thousands of people at this one, runners as far as you can see. The race was through midtown Atlanta and the Start / Finish lines were in Piedmont Park. The participants were awesome, the race was a lot of fun and even the spectators got into it. People would cheer and honk their horns as we ran (errr, walked) by and one guy had the Rocky them blaring as the crowd came by. My official time was 57:19.67 and my goal for this year was to finish under an hour – mission accomplished. 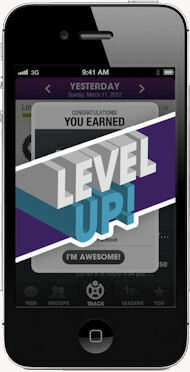 I’m already looking forward to see how much I can improve by next year’s race. I’ve already framed and hung up my bib, this is a milestone for me and having it on the wall will remind me how far I’ve come in a relatively short time and keep me pushing on to lose weight and get in better shape. I’ll definitely do the Firefly Run again and might even jump in a few other 5K’s. Next weekend I’m back to hiking, weather permitting I’m heading up to the GA/NC state line to Brasstown Bald to view the fall foliage. 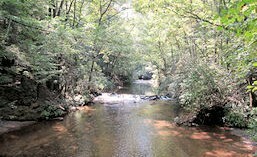 This trail is #2 in the book 60 Hikes Within 60 Miles of Atlanta. I picked this book up recently and I’ve set the goal of hiking all 60 trails in the book. With this hike I’ve completed 4 of them, only 56 to go! 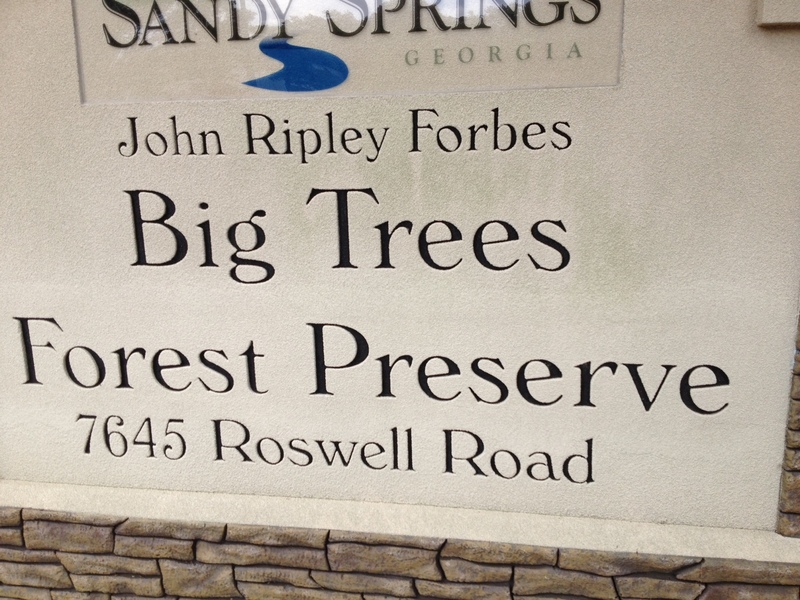 The Big Trees Preserve is off Roswell Road in Sandy Springs, the trailhead is actually in the south parking lot of the North Fulton County Annex. The preserve has several trails that criss-cross each other, which confused the heck out of me but admittedly that’s not always hard to do when it comes to navigating. Your hike starts off on a paved path and then splits onto a mix of packed dirt and wood mulch, certain areas of the trail had piles of mulch where they were improving the trail. Depending on the branch of the trail you take the hike can be from 1.2 miles and up, I ended up at 1.3 miles over a 35 minute hike. There are some steady hills on the Backcountry Trail and although the book states they are “so well done they are effortless” they gave me a pretty good workout. You get some nice views of a rocky creek as you wind through the trails. My dog cooled herself off in some of the clear pools that formed. Several of the trails wind along and over the creek with small bridges to cross. In certain areas you can walk along the creekbed on rocks and still stay dry. There is quite a bit of wildlife as well with bird feeders scattered throughout. I saw a variety of birds as well as squirrels, chipmunks and a couple lizards. Some of the trees are marked to identify them, there are a lot of large white oaks in the preserve. 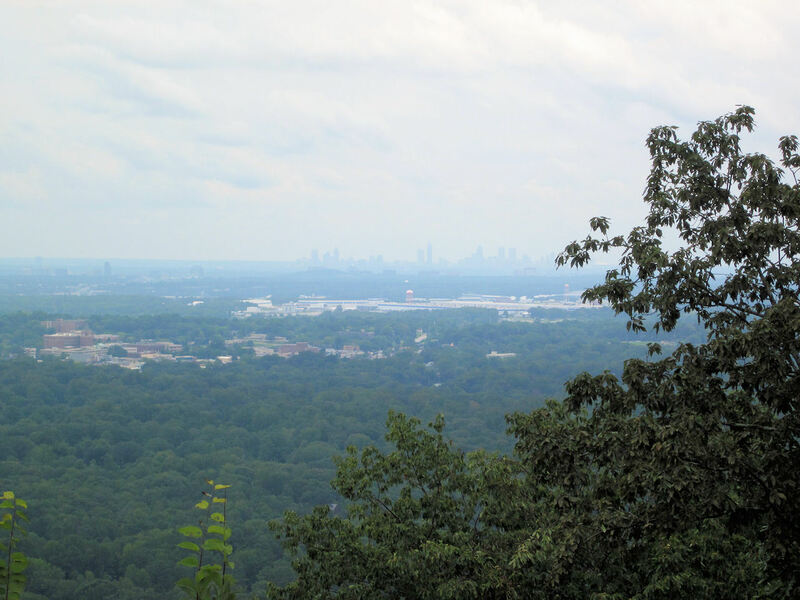 This is a great escape from the city that sits just outside of the area and is secluded enough to block out the traffic noise from Roswell Road. 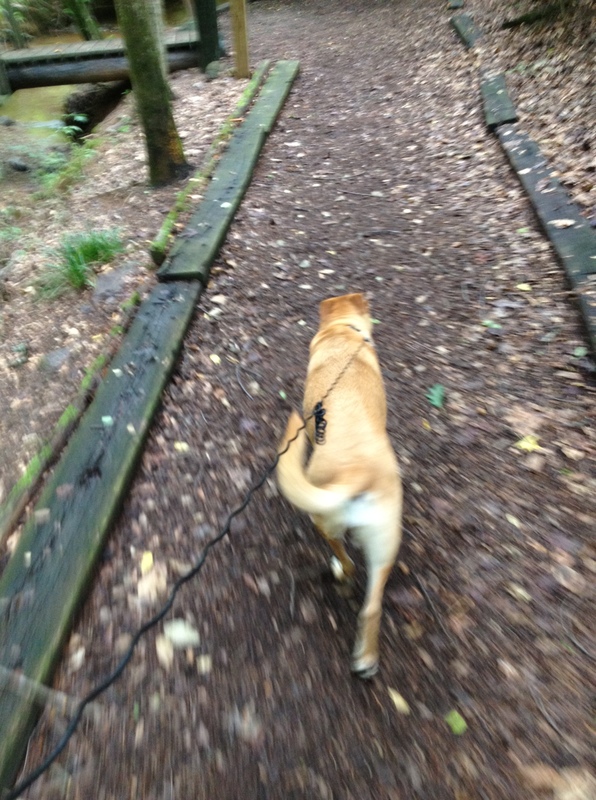 Boo walking the trail sporting her fancy cell phone charger leash. One complaint on this trail, and I’m not sure if it was just the people there this particular day, but even though the trail sign clearly states that dogs must be leashed at all times I came across 3 different people allowing their dogs to run free. I forgot my leash and home and had to MacGyver one up so I used an old cell phone charger tied around my dog’s collar to “leash” her. May have looked totally redneck but it got the job done. One family had a little schnauzer with a bad attitude, they were holding the leash but allowing the dog to run free. We passed each other 3 separate times and each time they’re dog ran up to my dog an started growling and barking, they would run up and grab him and say, “Sorry, sorry about that.”, but still didn’t put him on the leash. Another couple had two large dogs running free and as I passed one of them said, “We’re good here, all of us are friendlies.” That’s not the point though as you don’t know how my dog will react to your dog running up to her. There are also people who are quite afraid of dogs and even if you have the friendliest dog out there they could be intimidated. So a note for those that hike with dogs, please leash your dog at all times. My dog is super-friendly but she will defend herself if need be, and I absolutely love dogs but if a dog runs up to me snarling and barking I’m not going to take too kindly to it. Even with the dog problems I enjoyed this little trail. It’s good for a quick hike and the continuous tree cover keeps it fairly cool. It’s nice to find something like this so close to the city where you can tuck away for a little while and avoid all the hustle and bustle. 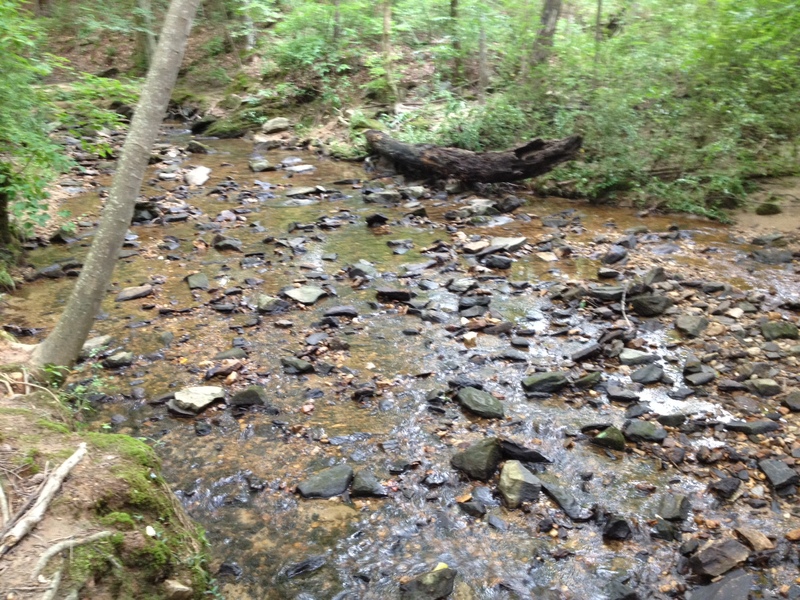 One view of the creek along the trail. The trail winds alongside the creek for most of the hike. 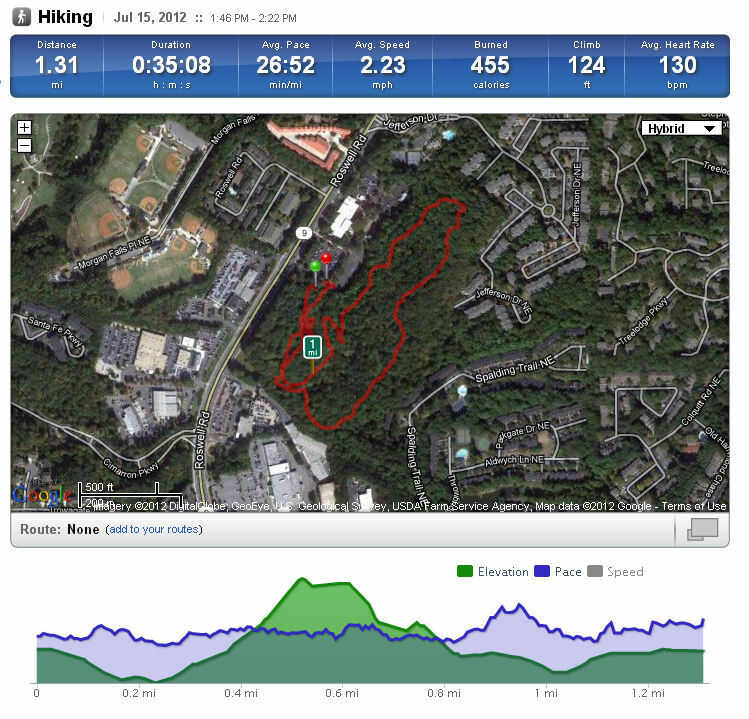 This past Sunday I went to Chattahoochee Nature Center in Roswell to hike their trails. CNC is #15 in 60 Hikes Within 60 Miles of Atlanta. Difficulty: Easy with very small hills. Notes: CNC is a non-profit and they do charge admission, the adult admission price is $8.00 per person. The forecast for Sunday here was for it to be hot… very hot. I stepped out in my yard and thought, “It’s hot, but it’s not too bad, I’m going for a hike.” Well, I made my hike but boy was it a scorcher once I got moving around. Highest temp my iPhone showed while I was hiking was 101F, it was actually difficult to breathe the air at that temp, I ended up cutting this hike a bit short but still got to see a good bit of the nature center. CNC sits along the banks of the Chatthoochee River. The trails wind around a couple lakes on the North side of the river and there is also a boardwalk trail on the river. In addition to the trails CNC also has a small indoor education and some love displays with possums, snakes, owls, turtles and a few fish. 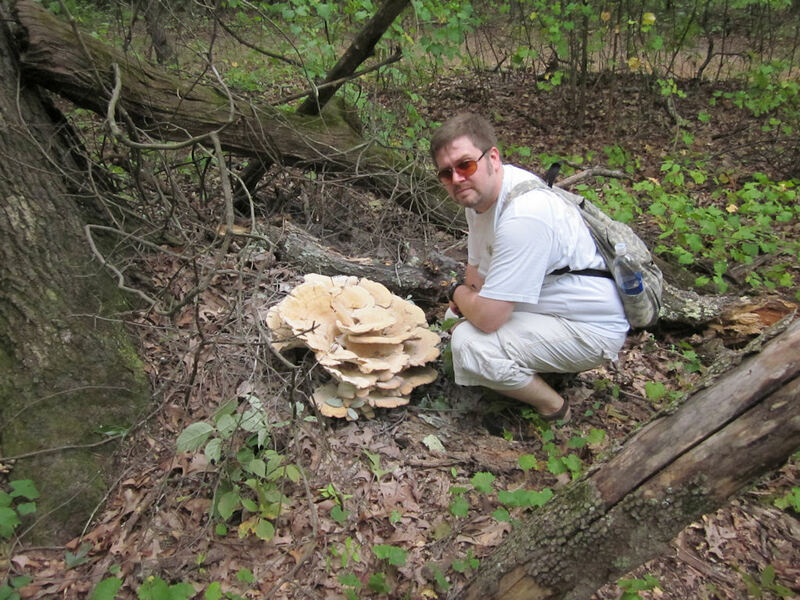 They do offer guided hikes as well, stopping to tell a bit about the flora and fauna as you hike the trails. Outside the nature center is an aviary. There are enclosures with a few types of owls, bald eagles, vultures and hawks. There is also a beaver habitat where I found a stubbornly camera shy beaver hiding under the banks of his little lake. In addition to the displays there is also quite a bit of natural wildlife including squirrels, chipmunks, turtles, many birds and fish. There are a variety of trails in the park including paved trails, natural forest trails and the river boardwalk. All of the trails are easy with the forest trail having some slight hills as you wind through the trees and along a lakeside. Throughout all of the trails are signs noting the different animals and plants you might encounter. All in all it was a very enjoyable, although hot hike. There’s a lot to see at the Nature Center and I’ll definitely go again when it cools down.